We know that keeping your contacts in sync within Sellf and other tool you're using is crucial to your business. PieSync does this for you: it works in the background and integrates your contacts two-way and in real time between your favorite cloud apps. This means you will have access to the most up to date customer information, no matter where you are or who entered the data. Every time you add or update a contact in Sellf, it is automatically synced with the other app, and vice versa - eliminating import/export! In case you're thinking about it, Zapier only pushes data from one app to the other in one direction. This could be very useful in many cases, but sometimes it's not enough. Zapier is more about pushing data from one app into another, automatically adding information to help you automate tedious tasks. Take a look at the video below, where you can see PieSync in action: integrate Sellf and sync your customers data with other tools, like Shopify or Mailchimp! 2. Sign into your PieSync account. 3. Create a new connection: select the first two apps you'd like to sync contacts across, in this case Sellf and another app. 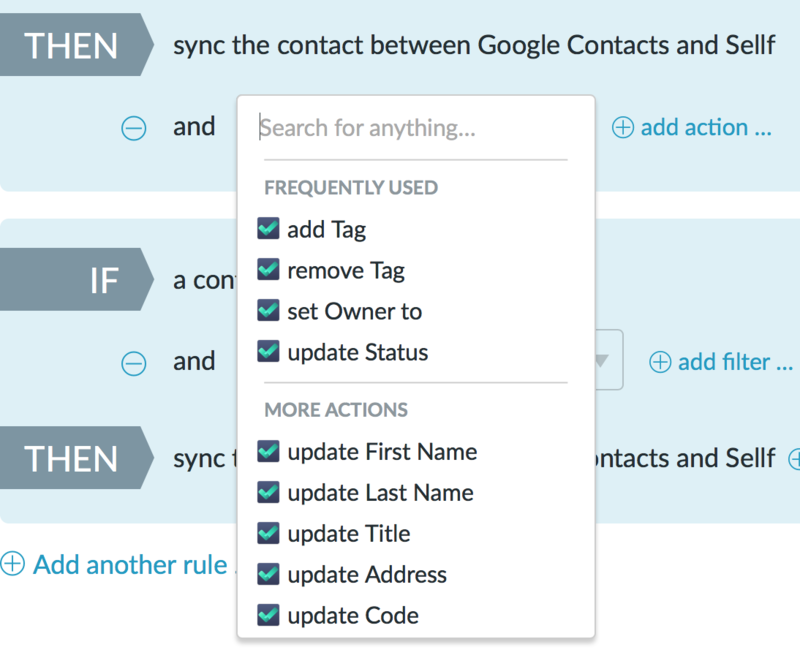 With the following steps, you'll go through creating a 2-way sync between Sellf and Google Contacts. To authorize, simply follow the steps as described below and make sure you meet the requirements to be able to sync. PieSync needs your Sellf API Key to authorize. 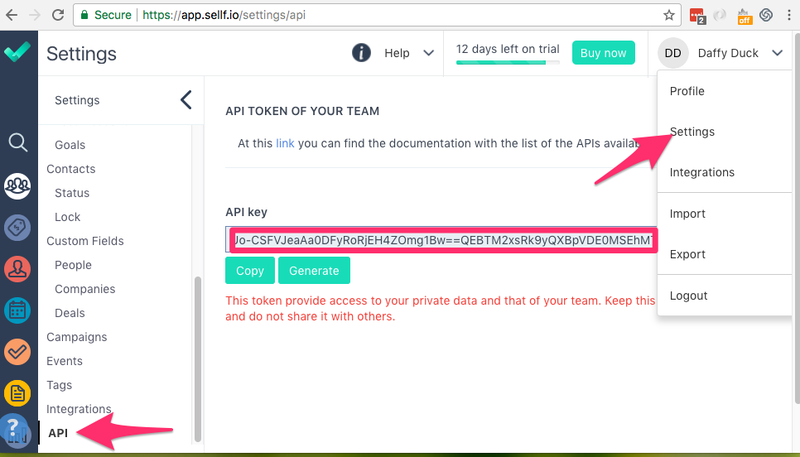 You can find your Sellf API Key under Settings --> API. Click on"Generate" and then copy the key. Then PieSync needs an authorization for each user in your Sellf team. 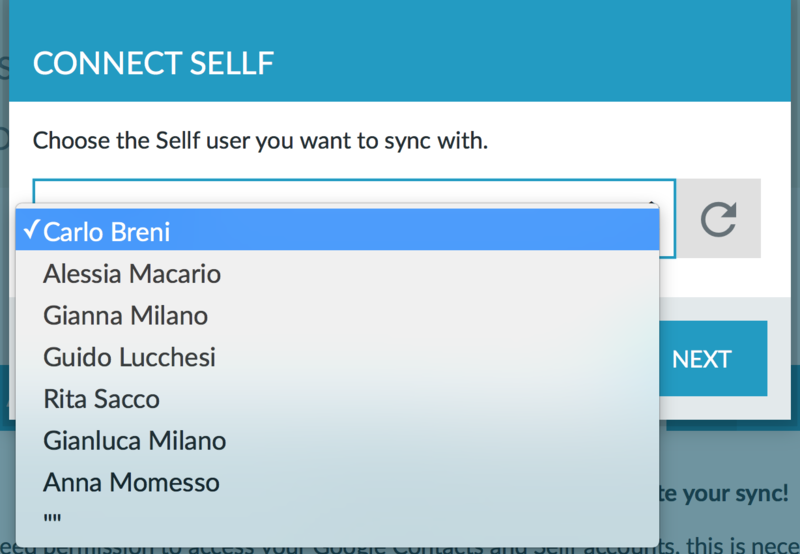 This means you need to set up a new connection for each Sellf user you want to keep in sync. You can choose from all your existing users in the authorization step after entering your login details. If you already authorized Sellf account(s) in the past or in any other PieSync integration, you'll be able to skip the first part of the authorization and choose from your CONNECTED ACCOUNTS. 5. Connect to your Google Contacts and accept Permissions. 6. Now you'll see how the contact sync between Sellf and Google works through PieSync. 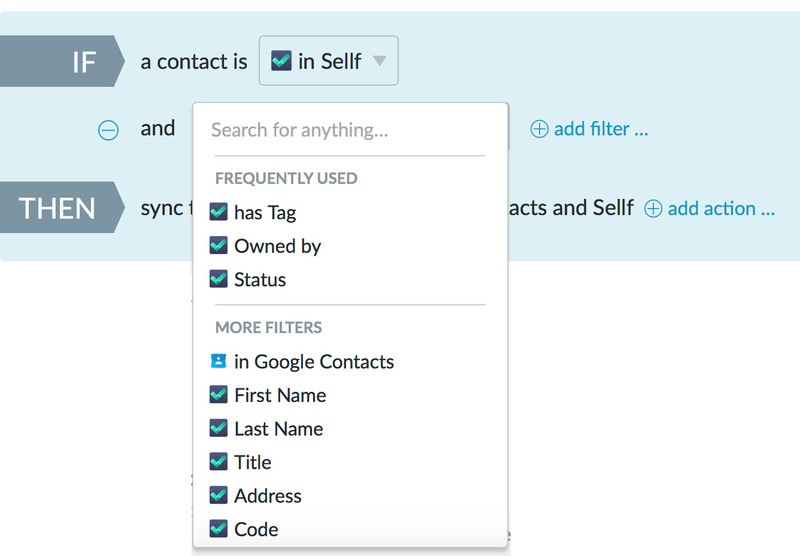 IF a contact in in [Google Contacts] THEN sync the contact between Google Contacts and Sellf. As you can see below the sync is two way. You will be able to set filters to the IF condition and add actions to the THEN condition. You can also add more rules. Avoid Duplicates: Only sync contacts that have an email address. This is a recommended option to avoid duplicates because PieSync uses the email address as the unique identifier. 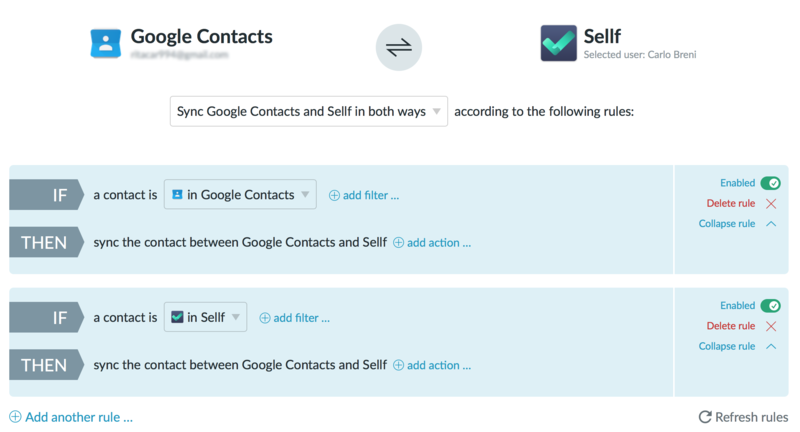 Sync Deletions: In connections between Google Contacts and Sellf, you are able to sync deletions one-way. When a contact gets deleted in Google Contacts, PieSync adds the tag 'PieSync Trash' to that same contact in Sellf. You will be able to review this segment first before deleting or taking any other action in Sellf too. Syncing Unsubscribes: In connections between Sellf and some marketing tools supported by PieSync such as e.g. MailChimp, you are able to sync unsubscribes one-way. When a contact gets unsubscribed in your marketing tool, PieSync adds the tag 'PieSync Unsubscribes' to that same contact in Sellf. You will be able to review this segment first before taking any action in Sellf too. Additional Options: Specify the master app when there are conflicting changes in the two apps. 9. Check the FIELD MAPPING. PieSync also supports Sellf custom fields. 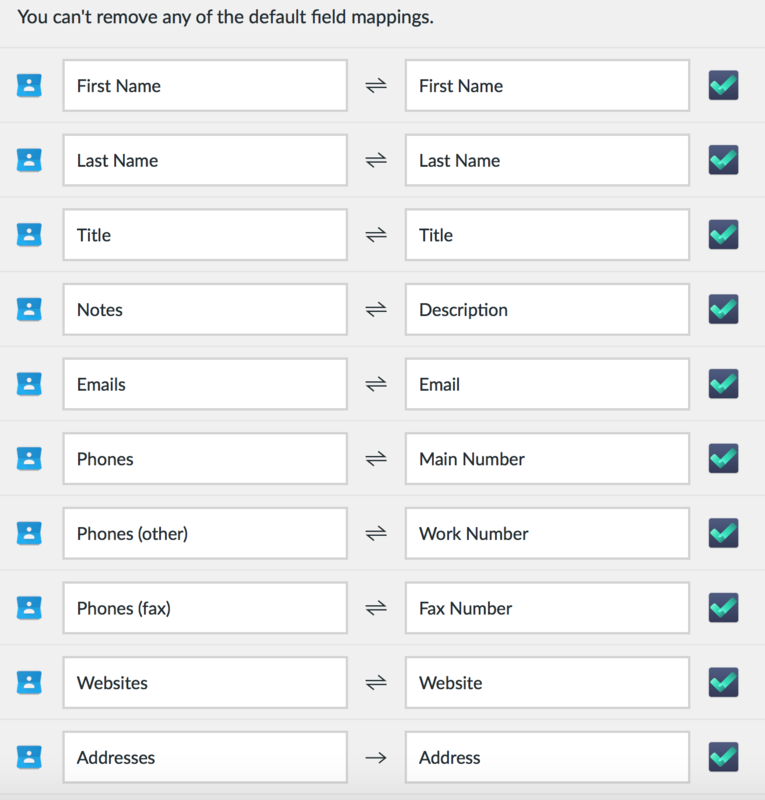 Therefore, you can custom map any additional standard fields that aren't included in the default mapping yet. Bear in mind a mapping between two fields can only exist if the types of fields are compatible, and the particular compatibility will determine the direction of the mapping as well. More information on Customizable Field Mapping here. 10. Then click on "START SYNCING NOW!" button and enjoy the Contac sync! 11. Now you'll see the dashboard of your connection. The time an initial sync takes completely depends on how much contacts you have, however in 15 minutes or less you'll be set. Every 5 minutes PieSync checks if anything has changed in the contacts you're syncing. 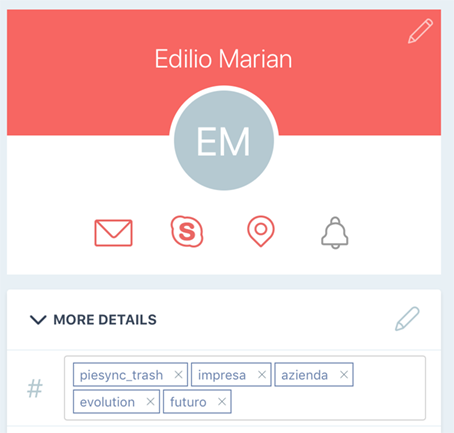 Every new contact or contact update will get synced automagically according to your sync settings! Click on "Configuration" from the dashboard if you need to change the settings of your connection. Stay in touch - How to remember to call a customer?